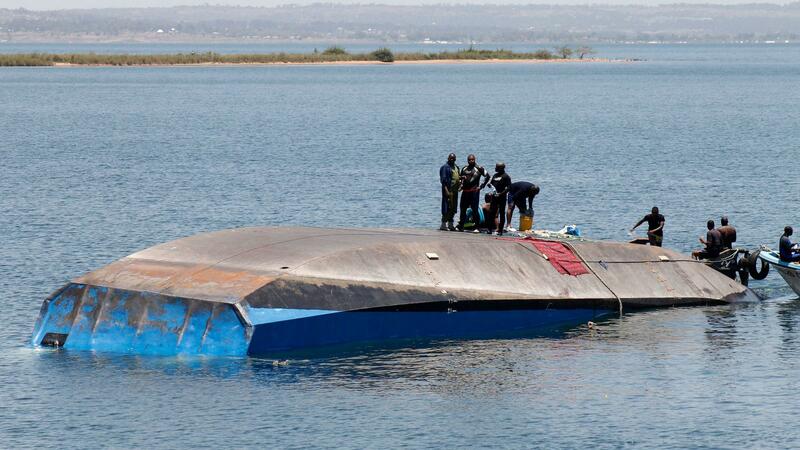 Tanzanian rescue workers search for victims after the ferry MV Nyerere capsized in Lake Victoria. A survivor was rescued from inside a Tanzanian ferry two days after it capsized on Lake Victoria, killing at least 207 people. The condition of the survivor was not immediately clear. Citing the state-run Tanzanian Broadcasting Corporation, the AP reported the man was an engineer and had locked himself in the engine room. The BBC reported he survived because of an air pocket inside the vessel. Divers resumed their rescue efforts on Saturday after hearing knocking noises that suggested signs of life, according to the BBC. The overcrowded ferry was reportedly traveling between the islands of Ukara and Ukerewe on Thursday afternoon when it sank. It's thought that the ship tipped when passengers moved to one side when the ferry docked, NPR's Ofeibea Quist-Arcton reported. It's unknown how many people were on the MV Nyerere but the ferry was especially busy on Thursday because it was market day in Bugolora, on Ukerewe Island. With the capacity to carry 100 people, at the time it sank, it's estimated that several hundred people were on board. At least 40 people have survived, according to the AP. It is unknown how many are still missing. The ship was also carrying cargo that exceeded the 25-ton limit, including bags of maize and crates of beer, when it sank around 50 meters (164 feet) from land, according to the BBC. Tanzania's President John Magufuli declared four days of mourning and ordered the arrests of the people responsible. "This is a great disaster for our nation," Magufuli said late Friday in a speech on TBC television. The country's opposition accused the government of negligence saying it was "another failure of the authorities." "We have often raised concerns about the poor condition of this ferry, but the government turned a deaf ear," John Mnyika, deputy secretary general of the main opposition party Chadema, said according to the AFP. It's not the first time Tanzania has faced this kind of disaster. NPR's Quist-Arcton told Morning Edition's Rachel Martin overloading and overcrowding is common in tragedies like this one. "These sorts of ferry disasters where Africans are using waterways almost as highways in the U.S. ... happen periodically, and sometimes hundreds of people are killed," Quist-Arcton said. In 1996, more than 800 people died when the MV Bukoba capsized on Lake Victoria in one of the worst disasters of its kind in the last century.